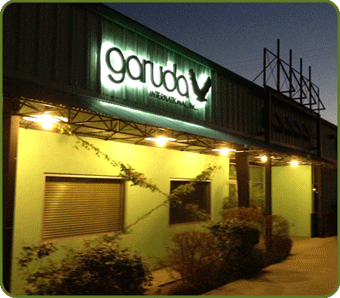 Garuda International Inc., based in Exeter, CA (USA) has specialized in the development, manufacturing and the marketing of ingredients derived from natural sources for more than 25 years. Our products provide a variety of nutraceutical benefits to foods, beverages, dietary supplements and cosmeceuticals. Garuda International Inc. is well known and globally recognized for the pioneering and development of natural milk calcium in the United States. Garuda manufactures the COWCIUM® Natural Milk Calcium and the equally recognized LesstanoL® Natural Octacosanol and Policosanol. Today Garuda International offers more than 80 products and our customer base/clients span more than 30 countries throughout North America, Europe, Asia, Africa, and Australasia. Many include well-known multinational food, cosmetic, dietary supplement and pharmaceutical companies. Garuda is committed to providing the finest ingredients and we are committed to making a difference in the industry. We maintain memberships with the respected NNFA, IFT, AHPA and the American Botanical Council and are represented at health/industry forums and tradeshows worldwide. Thank you for visiting our website. All of us at Garuda International sincerely appreciate your trust in our products and we look forward to our continued successes. Please contact us for any additional information, other technical documents, price quotations, samples or any other assistance you may require. Mr. Matkin, founder of Garuda International, Inc., and its CEO brings with him, more than thirty years experience in the nutritional foods and nutraceutical industries. His chemistry background and experience heading botanical growing and processing operations, have enabled Garuda to develop its innovative and technically superior ingredients. He has built the company based upon his personal philosophy that to achieve success, one must create success for others. It is this founding principal that guides Garuda International to this day. Melanie Stephens has dedicated more than a decade to perfecting her skills in customer service and the intricacies of domestic and international supply chain logistics. She has acquired a broad knowledge about the benefits of Garuda's functional and nutritional ingredients and shares her expertise with clients worldwide. Melanie manages Garuda's corporate headquarters and reaches out to clients and vendors worldwide to ensure exceptional response times and delivery of shipments.